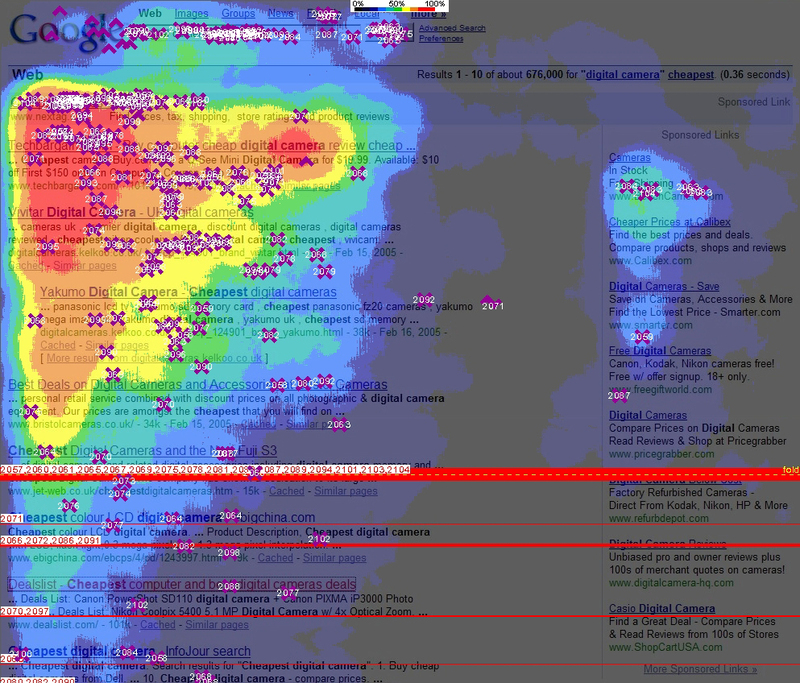 Saw this webpage about the study of eye movement on search engines such as Google. A new study has added tangible evidence to the widely held view that top-ranking search results get the most attention from users, and that lower-ranking results are all but invisible to most people. The joint study conducted by search marketing firms Enquiro and Did-it and eye tracking firm Eyetools examined the eye movements of users viewing Google search result pages. The study found that most viewers looked at results in an “F” shaped scan pattern, with the eye travelling vertically along the far left side of the results looking for visual cues (relevant words, brands, etc) and then scanning to the right, as if something caught the participant’s attention. The researchers called this pattern a “golden triangle” at the top of result pages. The triangle extends across the top natural search result, then angles back to the left of the page down to the bottom-most “above the fold” result, typically in the third or fourth position on the page.